Although some gospel enthusiasts will wince at the far-from-original concept of a TV talent search, few would deny that BET's Sunday Best series is continuing to bring to mass audience attention exceptional vocalists. Joining the growing list of singers who've gone on from the series to become successful gospel recording artists is St Louis-born Amber Bullock. The single mother of three year old Amya was the winner of Season 4 of Sunday Best, the final being broadcast in September 2011 before a cable TV audience of two million. Amber had grown up singing gospel with numerous choirs and recording artists. She sang with Myron Bulter & Levi, Troy Sneed and Youth For Christ, Meaghan Williams and Oscar Williams. She performed with Perfected Praise in a Christmas theatre production in Italy. 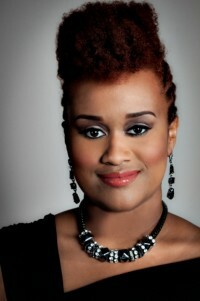 She also was a member of the gospel choir Changed, under the direction of Sean Tillery, based in Baltimore, Maryland. But Amber's life was far from easy. She was living and working in Dallas, where she had moved to be with her mother. Shortly after moving to Dallas, Bullock and her daughter were in a bad car accident that completely wrecked her car. After another unfortunate incident, Bullock ended up sleeping on the floor in the house of a co-worker who had six children. She was also unable to get Amya into a daycare centre. Life had become so difficult for Bullock at that point that she had to send her daughter to live with her father. Once her daughter was with her father, it was difficult to see her regularly without a car, which made her life even more challenging. Praying for a blessing, Bullock decided to attend the last day of Sunday Best auditions at the Potter's House in Dallas, Texas. Near the end of the day, word had spread among the staff and other contestants that the lady with the "Red Feather Earrings" had the "most amazing voice and the slickest runs." Bullock recalls praying, "Lord, let your will be done." The final of Sunday Best, before such judges as Shirley Caesar, Yolanda Adams, Lecrae, VaShawn Mitchell and Rance Allen, was held on 11th September. Amber win brought her a new Ford Explorer and a recording contract with Mathew Knowles' Music World Gospel label. Amber's first recording after the high profile win was the seven-song mini-album 'Thank You'. She told dagospeltruth, "We did that record very fast. Everything from the production, the background vocals, my leads. . . everything was done in three days. Eric Dawkins [of Dawkins & Dawkins renown] did all the production and some of the background vocals with me, so for the amount of time we had, I think it turned out pretty good. Another reason we were so pressed for time is because I was heading out on the Fearless tour with Kirk Franklin. It didn't make sense for me to have this big platform and not have any product to sell." 'Thank You' contained Amber's version of Kurt Carr's "For Every Mountain" which she'd sung so effectively on Sunday Best; a smouldering version of Dorinda Clark Cole's "If It Had Not Been For The Lord"; and a gospelisation of Chris Tomlin's "How Great Is Our God". But the track which caught the ear of gospel programmers and CD buyers across America was Amber's version of Walter Hawkins' "Thank You Lord". After 'Thank You' made number one in the US album charts an album, 'So In Love', has now been released. On the project Amber worked with PJ Morton, son of gospel legend Bishop Paul S Morton, and an award winning producer and songwriter. 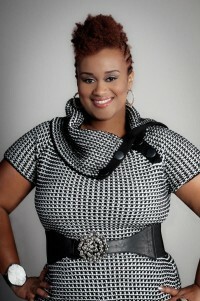 Amber spoke to thegospelguru.com website about working with Morton. "I'm the hugest PJ Morton fan ever! When they asked me who I wanted to work with he was the first person that I chose. Initially, it was supposed to be a seven-song CD and somehow three songs got added at the end. I don't know. . . people submitted songs and we chose what we thought fit best. I listened to the CD over and over and one moment one song was my favourite then next it was a different one." Amber was asked what advice she would give to Sunday Best Season 5 contestants. "Well, I actually went to all of the tapings because my pastor auditioned and he made it to the Top 25, so I went down there for that. And I did get to speak to the contestants and I just encouraged them and let them know that this is a competition, but all in all this is just a platform, this is television. Only one person can win, but that doesn't mean only one person wins. It means everybody wins, we're all on TV and it's different strokes for different folk. I encouraged them in that way, to treat the competition just as a platform."